Summertime in Lima is pleasantly warm, therefore light clothes are your best option. Right around the time the sun is setting, a cool breeze can drift in off the Pacific Ocean so you may want to carry a thin jacket or shawl if you'll be along the coast, especially if you're inclined to get cold easily. The Winter season, however, is a different story. Don't be fooled by the mild temperatures because the high humidity, frequent drizzle and strong maritime winds create the perfect conditions for a nasty cold. Make sure you bring at least a scarf and a heavy jacket or coat to keep you bundled up. Lima's climate is considered to be mild year-round. Though it is a sub-tropic region and the second largest city located in a desert next to Cairo, the cold Humboldt Current running along the Peruvian and Chilean coasts regulates the temperatures and keeps the city just warm enough in the winter, and just cool enough in the summer. 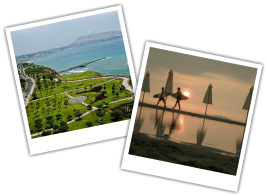 With such a moderate climate, there are typically two discernible seasons, summer and winter. 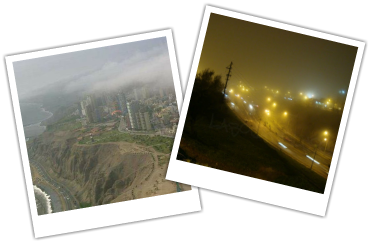 Lima's summer runs from December to April and is generally warm, humid and sunny with an occasional dense fog that appears in the mornings but clears by the afternoon. Temperatures range from lows of 64-72°F and highs of 75-84°F. The sunsets during this season tend to be impressive with vibrant colors stretching across the sky and setting it ablaze. Winter stretches from June to October and is characterized by grey skies, heavy fog throughout the day and a light drizzle the locals call "garúa." Temperatures hover between a low of 54-61°F and a high of 61-66°F along the coast; however Peru's capital is well known for its micro-climates. One can travel even 20 minutes away from the coast and find sunny areas that reach up to 5° warmer than coastal temperatures. Though the humidity is quite high, rainfall is nearly nonexistent in Lima.